While in Santorso in Italy for the Transition Hubs Gathering, I pieced together, from various people, the remarkable story of Alessandro Rossi. Given that it is a story heard from different voices, at various times of day or night, through my poor Italian, and that there is nothing I can find online about him, so this is very much a story of Alessandro Rossi, rather than the story of Alessandro Rossi. It may not even be a story that bears that much resemblance to the actual story of the real Alessandro Rossi, but it is my story, inspired by him. It’s a great story though. Map for visitors to Parco Rossi. 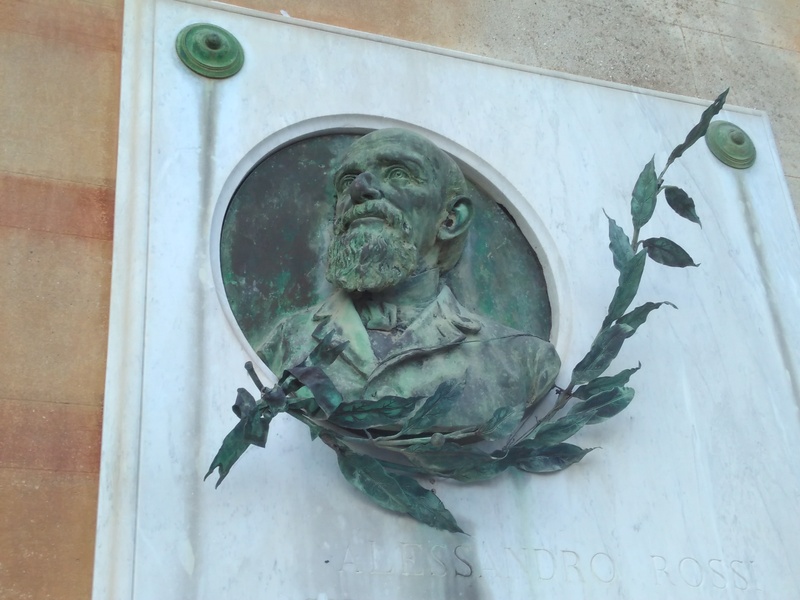 So, in the mid 19th century, there lived a man called Alessandro Rossi. He lived in a town called Schio, at the foothills of the Alps. His father ran a small factory which processed the local wool into fine fabric. In his early 20s, Alessandro was very inspired by the possibilities of regenerating the economy of the area, and of increasing the processing of local wool, which came from the sheep that grazed the hills above the town. He travelled to Manchester, at the time one of the epicentres of the Industrial Revolution. He was deeply inspired by what he saw there: the new technologies, the mills powered by water, the sense of progress and possibility. Instead of statues of lions, as was commonplace, Rossi had statues of sheep in front of his house. When he returned home, taken with the idea of implementing what he had seen, he decided that the best place would be Santorso, a village in the hills just above Schio. It had the water sources that would make the kinds of mills he had seen in Manchester a possibility. It was closer to the farms where the wool was being gathered. It was perfect. He was seized with a vision of what Santorso could be. He went to meet with the local government, and they turned him down. They were worried that such a project would give Rossi too much power, power that they were rather enjoying being in control of. So they said no. Rossi was furious. After all, here he was, offering this place the opportunity to innovate its way into the new world of industry and wealth generation, and they were turning him down. So instead, he opened his factory in Schio. In time that factory went on to employ over 8,000 people. It funded schools, theatres, all kinds of resources and initiatives in the city. He promoted literacy among his workers, and offered much better working conditions than were common at the time. Initially he imported equipment from Manchester, but over time, he found engineers who were able to make it for him locally. Antonio Rossi in later life, with someone unenthusiastic granddaughter. The equipment that he subsequently made in Schio was sold all over the world. I was told by one couple that they visited a museum in Ireland about the wool industry there, and there in the museum, was one of Rossi’s machines. His whole approach was underpinned by a belief that agriculture needed to rise at the same rate as industry, that the two things needed each other, that industry that lost touch with agriculture was lost. This belief is captured in these two stone reliefs alongside each other in his garden. But Rossi’s fury at Santorso’s rejection was to underpin and to shape the rest of his life. On the wall outside his factory in Schio, he put a large notice which said that no-one from Santorso was ever to work in the factory, nor even to set foot in it, on pain of death! He bought a large estate in Santorso, and built a beautiful villa there, and created an amazing park, containing ponds, grottos, aquaria, a collection of trees from around the world, an amazing place. So determined was Rossi to express his disgust at the people of Santorso that he built a huge wall around the whole place to keep people out. At the entrance to his house, either side of the door, instead of the customary lion statues, he had two statues of sheep, but they served the same purpose, to ward off the locals. He even built a tunnel beneath the road that ran between his villa and the park so that he could get into the park without having to meet any local people. The wall to keep locals out. The tunnel that runs under the road. His operations spread to many other towns and villages along the valley, but never to Santorso. He became a wealthy man, and dedicated his later life to politics, but never lost his gratitude for the role that sheep had played in his fortune. Legend has it that whenever he was travelling in the region, and a sheep crossed his path, he would make a point of going over to thank the sheep for his good fortune. When he died, his Villa and the rest of his estate was left to a foundation, and for a while, the Villa became an orphanage. His Parco Rossi was, eventually, opened to the public, and beneath it, on the lowest part of his land, there now exists Oasi Rossi, which offers support and training for people with physical and learning disabilities, through growing, preparing and cooking food, as well as having a play park open to the public. The story fascinated me because it contains some of the ingredients of Transition, but conspicuously misses others. For Rossi, what mattered was his idea, and that people would like it. But how different might things have been if he had been able to find a way to start the conversation by focusing on the needs of Santorso? If his first question had been “how can I help you to meet your needs?”, rather than “how can you help meet mine?”, how different might things have been? It may well not have been as straightforward as that, and I have no idea of the personalities involved, but it did lead me to reflect on the importance of how when we think about REconomy, and exploring the possibilities for economic regeneration of our place, that such an approach is so much richer, more embedded, respected and valued, if its opening question is “how can we help?” While it can take more time, and requires conversation and compromise, it does, at least, mean not having to spend the rest of your life behind high walls glowering at anyone who wanders past! Thanks to Giulio and to all the other good people of Santorso who took the time to share their versions of the story of Alessandro Rossi with me. What a beautifull way to relate the vision of one man to the possibilities we have now with the Reconomy at Transition, i would like to translate this story in French to publish it on the website, is that OK? Please do. Glad you like it! Delightful story, Rob. I learned about “how can I help you” when I worked as Volunteer Coordinator at Children’s Home Society of Washington. Some people would donate items that our families did not need. Others would ask first. This consideration made a big difference on our work load. Reading the story made me think of/see Alessandro Rossi working off his Karma. Oh, the lessons from Ego to Heart centeredness.